A TEENAGER with a one-in-a-million genetic disease has had her appeal to stay in the UK refused, despite being seriously ill in Great Ormond Street hospital. The Home Office dismissed the case of 15-year-old South Camden Community School (SCCS) pupil Zarine Rentia yesterday (Wednesday), citing a lack of “sufficient compelling circumstances to justify her remaining in the UK”. The wheelchair-bound student, who suffers from the bone marrow disease Fanconi-Bickel Syndrome (FBS), was appealing her removal to India on the grounds it would compromise her treatment when her condition took a sudden turn for the worst last week. She began losing weight and vomiting blood and was admitted to Great Ormond Street last Monday. Doctors are still looking for the final cause of her detoriation but progress has been slow owing to the rarity of the disease – there are only 112 other cases of FBS reported in medical history. Zarine’s mother Tasnim, who is staying in hospital with Zarine throughout her illness, implored immigration officials to come to the hospital and see her child’s condition for themselves before they made a decision. 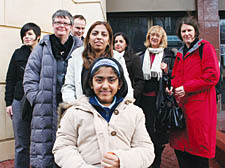 In her conclusion, immigration judge Justice Herlihy said she had “enormous sympathy for Zarine” but was not satisfied “(Mrs Rentia) has provided satisfactory evidence that Zarine’s symptoms cannot be treated in India”, despite reports to the contrary submitted by several specialist UK doctors. Zarine and her mother have five days to apply for a review of the decision or Zarine may suffer the same removal as Ama Sumani, the terminally-ill Ghanaian woman who was removed from her sick bed in a Cardiff hospital last month by immigration officials and put on a plane back to Ghana. The Rentia’s legal team, CLC Solicitors, confirmed last night they were looking for grounds to make an appeal.